Officially released today in the US by Verizon Wireless, the brand new Motorola Moto Z2 Play normally costs $408 outright, or $17 per month for 24 months. However, you can already save $50 on the handset if you're not buying it directly from Verizon, and you're ordering it from Best Buy instead. According to Best Buy, you will - unsurprisingly - need to purchase and activate the Moto Z2 Play on a Verizon monthly installment plan. All in all, you'll end up paying $358 for the phone, instead of $408. Supplies are limited, so you might want to hurry up if a Verizon Z2 Play is on your shopping list. 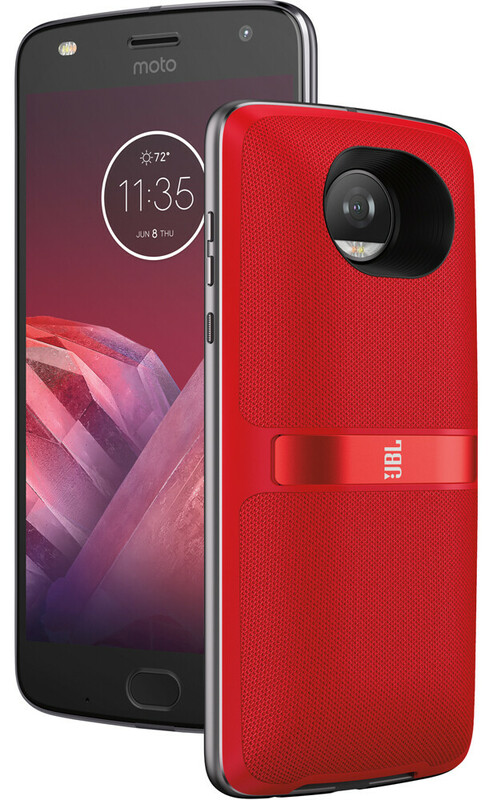 If you choose to purchase the handset via Best Buy, you're still entitled to get the free JBL SoundBoost 2 Moto Mod speaker (seen above) that Verizon is offering to Z2 Play customers. Design-wise, the Z2 Play resembles last year's Moto Z Play, but it's a bit thinner and has a redesigned fingerprint sensor on the front. The new smartphone runs Android 7.1.1 Nougat, sports a 5.5-inch 1080p sAMOLED display, and is powered by a Snapdragon 626 processor. Other notable features include a 3000 mAh battery (for at least 1 day of usage), a 12 MP rear camera, 3 GB of RAM, and 32 GB of expandable storage space. In case you're wondering, an unlocked, non-Verizon version of the Moto Z2 Play will be available directly from Motorola later this summer.